I’ve been meaning to sit down and write about how it’s just about time for New Yorkers to go back on coyote watch. Well, the coyotes beat me to the punch. While I’ve been dawdling, the animals have been on the move. The first New York City coyote of the season was spotted this past weekend in Queens. Yes, Queens. It’s around this time each year, in the heart of winter, that parent coyotes kick out the pups that were born the previous spring. While the parents get ready to provide for the next litter, the almost-yearlings go out in search of new territory. With coyote populations expanding and natural habitat shrinking, the wild dogs are increasingly making their home in suburbs and cities. Last winter, several coyotes were spotted in Manhattan with one animal taking up residence for weeks in Central Park’s Hallett Nature Sanctuary before being captured downtown in Tribeca. The New York Post reported yesterday that a coyote has been seen in Cavalry Cemetery in Woodside, Queens. Cemeteries and golf courses offer good habitat for a coyote’s natural prey, including rabbits, squirrels, mice and other rodents. 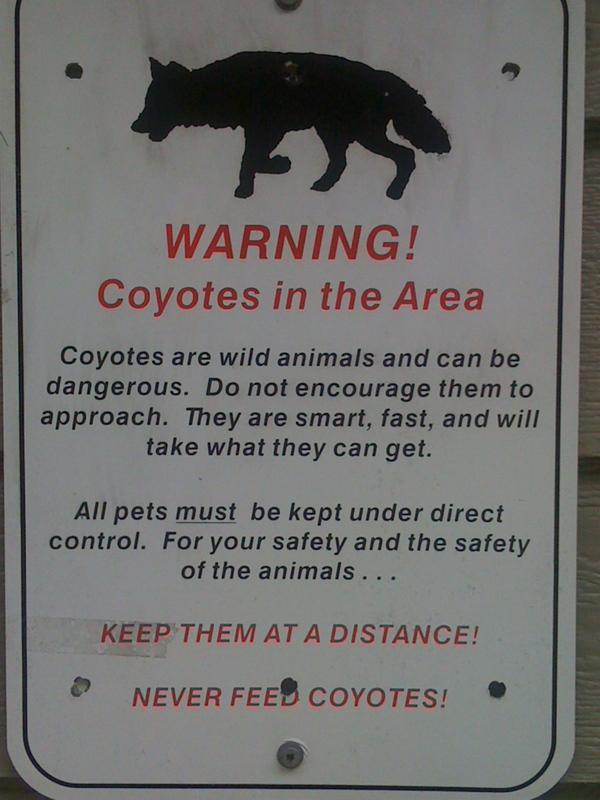 Many experts have said that Long Island, is the only large land mass in New York State that is not home to coyotes. No longer. Whether New Yorkers realize it or not, Queens is on Long Island. But how did the coyote get to Queens? A large breeding population exists in Westchester with a small population in the Bronx. Last winter’s Manhattan coyotes may have crossed from the Bronx to Manhattan via the railroad bridge, or they may have swum across. No one knows for sure. One possible route for the Queens coyote would be to cross from Mott Haven and Port Harris in the Bronx to Randall’s and Ward’s Islands and from Ward’s to Queens. The coyote was spotted in a graveyard in Woodside. Reader, what do you think? If you have a better idea about How the Coyote Came to Queens, please leave a comment. Last winter, I had the good fortune to watch the Hallett coyote on several occasions, as it made its way out of the sanctuary after dark to hunt for food. Watching a coyote go about its business in the middle of a bustling city is a strange and magical event, as you can see in Bruce Yolton’s photos and videos of the Central Park coyote. Coyotes are naturally wary of humans. Problems with wildlife generally occur when the animals lose their distrust and come to see humans as a food source. No, I don’t mean we ourselves are food, but that we provide food, whether directly (“Here, pretty doggy, have a treat”) or indirectly, by leaving garbage – or small pets – unsecured. As natural habitats shrink, we will increasingly be sharing space with wild animals. Coyotes are successfully adapting to our presence. We had better start figuring out how to adapt to theirs. Meanwhile, don’t feed the animals. Sign in a park in Vancouver, B.C. 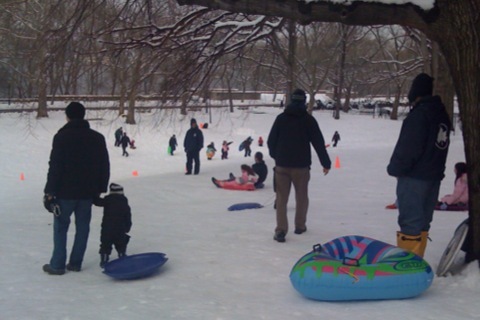 The Parks Department declares Saturday an official Snow Day, and is providing free sleds and hot cocoa at several parks, including Riverside at 103rd. Esau and I went by to check it out. We ran into Sunny and Sheriden, our Urban Park Ranger friends, who were supervising the happy sledders from the bottom of the hill. As always, I was delighted to see them and, of course, pumped them for the latest on Central Park’s rabid raccoons and visiting coyotes. In a little over a week, USDA biologists have already trapped, vaccinated, tagged and released around seventy raccoons in Central Park. Seventy! Add in the sixty rabid raccoons collected since December 2009, and it’s pretty clear that the total Central Park raccoon population must be well into the hundreds. This extraordinary population density has undoubtedly contributed to the rapidity with which the disease has spread. One raccoon, already tagged and vaccinated, found its way into a trap for a second time. Since it was injured (not related to the trapping, as far as I know), researchers euthanized it. Tests revealed that it was rabid. This doesn’t mean the inoculation failed, but rather that the raccoon had been infected prior to being vaccinated. Since rabies shows no symptoms until it reaches the brain (at which point the raccoon has only a few days to live), a number of infected but still apparently healthy animals are likely to be trapped, vaccinated and released. The disease will kill them, but meanwhile they may continue to infect healthy, as-yet-unvaccinated raccoons. Still, I’m impressed with the city’s response and the cooperative effort of state and local agencies. I remain hopeful that the virus will be contained and our raccoon population, dramatically culled by disease, will again be healthy. Sheriden also said that since the snowstorm, some of Central Park’s raccoons are finding their usual secretive pathways too deep in snow for comfort, and are taking to the main walkways of the park. She’s guessing they’ll be getting more calls than usual over the next couple of days as healthy raccoons that just don’t want to get their feet wet waddle down the same paths as rabies-conscious New Yorkers who are trying to steer clear of the wildlife. The Central Park coyote (or coyotes, since no one is quite sure how many there are) continues to run free. It is reported to be quite shy of people. 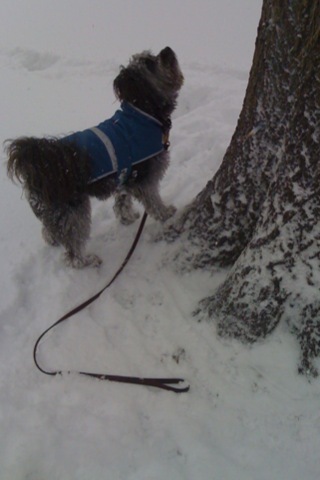 Sunny saw it once down at the south end of the park, playing with the snow. She said no one is trying to catch it, at the moment; they’re concentrating on the raccoons. And both she and Sheriden seemed to be hoping that it might be allowed to stay. I have to assume, though, that officials are considering the unfortunate possibility that the coyote may contract rabies from the raccoons. 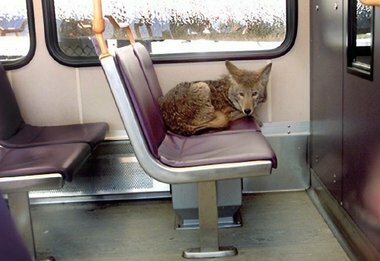 Whatever the eventual fate of 2010’s coyotes, evidence is mounting that coyotes are adapting to east coast city life. Ball’s in our court. We city dwellers had better start figuring out how we can adapt to them. Keep checking back for the upcoming series on coyotes in the east.